Limited quantity. Delivery in approx. 9-11 days. The latest edition in the Perth Mint's superb Lunar II Series, the 2018 1 Kilo Year of the Dog silver coin is an impressive addition to any collection. We anticipate a high level of interest in this truly magnificent silver coin. It's the 11th and penultimate release in the famous Lunar II collection based on the characters of the Chinese Zodiac and each contains a full kilogram of fine .9999 silver. The Perth Mint first launched a Lunar Series based on the Chinese Horoscope back in 1999, the Year of the Rabbit. The 12-year collection was so popular that the Lunar II Series was launched in 2008 with an overlap period of three years. Lunar I and Lunar II Series silver coins have different designs so two types of lunar coin were minted in 2008, the Year of the Mouse, 2008, the Year of the Ox and 2010, the Year of the Tiger. As the second series approaches its end, demand for these beautifully struck coins is higher than ever. This outstanding 2018 1 Kilo Silver Year of the Dog coin will make a stunning centrepiece for any collection, whether it's a mixed collection, a Lunar Series collection or a Year of the Dog collection covering coins of each size. The series is inspired by the stories of the 12 animal characters of the Chinese Zodiac and those born under the sign are said to share similar traits including loyalty and honesty. The reverse of this beautifully detailed Year of the Dog silver coin shows an adult German Shepherd resting beside a conifer tree with its puppy in the foreground while the obverse features a portrait of HM Queen Elizabeth II. Why choose the 2018 1 kg Silver Lunar II Year of the Dog coin? 2018 Lunar II Series1 Kilo Year of the Dog silver coins are among the purest on the market. Each contains a full kilo of .9999 silver and is manufactured to the Perth Mint's exacting standards. Their purity and greater weight also make these large 1kg coins a great choice for discerning investors. 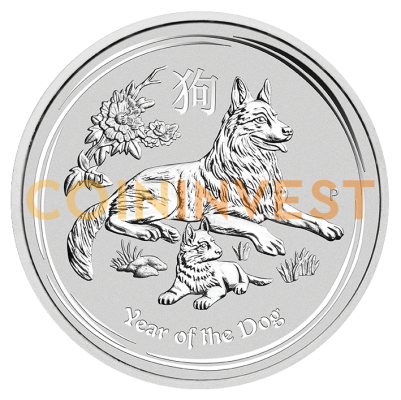 CoinInvest aims to bring its customers the best new releases from the world's most prestigious mints and refiners – such as this exceptional 2018 1kg Lunar II Year of the Dog Silver Coin. Individual coins are supplied in plastic sachets while orders of 10 are shipped in cardboard. Order now with coininvest.com for fast, insured delivery.